Fares: 30 € / 35 € night, 2 pers. min. Holiday rental : arrival at any day. Short stays allowed from 3 day(s) . Mansion 4 - 8 persons. Bedding : 3 Double bed, 2 Camp bed(s). Ancient house composed by two bedrooms, living room, kitchen, bathroom, garden and terrace. It's sited in the old heart of Linguaglossa village (reacheble by bus and local railway) on the east flank (550 meters) of M. Etna Volcano. 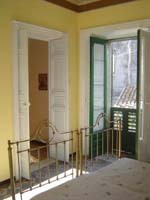 On the ground floor there are the hall and the little garden; upstairs there are the rooms with refurbished ancient furniture, and the terrace adjacent to the kitchen. 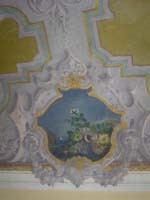 Some ceilings show reliable old nice frescos. Actually four beds are available, others may be added if needed. 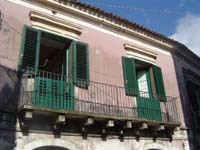 This ancient home built in 19th century, is 15 minutes (by car) from the sea, 20 from Taormina, 20 from Etna forest and volcanic theatres, 45 from Catania, 50 from CT Airport, 100 from Syracuse. Several interesting excursions (hiking or mountain-bike) may be enjoyed to the M. Etna, to the beach, to the Alcantara gorge, etc. The house owner (national authorized guide and geologist) will be happy to supply accurate trips information. Altitude 500 m / 1425 ft.
Natural park : 3 km. Detached house, Pebbly beach nearby, Rocky beach nearby. 40€ / 50 € night, 2 pers. min.